You are here: Home / Uncategorized / 450 More Jobs for Davie County as Ashley Furniture Continues to Grow! It’s another economic home run for Davie County as Ashley Furniture Industries Inc., the world’s largest home furnishings company, announced last week plans to create 454 new jobs at its Davie County facility over the next five years and invest an additional $8.7 million at the site by the end of 2019. Ashley plans to add these new positions in the areas of upholstery, case goods, mattress manufacturing, warehousing, and information technology. There are job openings available at the Davie site today. Click here to apply! Ashley initially committed to creating 550 jobs and investing $80 million in Davie County between 2012 and 2015. The company has already exceeded these commitments by creating more than 1,100 jobs and investing more than $250 million into its 2.8 million-square-foot, state-of-the-art furniture manufacturing and distribution facility and related training and development activities in Advance. Ashley Furniture is a global company with operations in 123 countries. Based in Arcadia, Wisconsin, it employs 25,000 people worldwide. The company currently operates manufacturing facilities in Wisconsin, Mississippi, Pennsylvania and California and has a distribution warehouse facility located in Brandon, Fla. The privately-held company had nearly $4 billion in sales in 2014. Ashley arrived in Davie County in April 2012 after an extensive, seven-year search for a site that would serve its growing customer base. When completed, the Davie County facility will encompass 3.8 million square feet and will be the largest furniture manufacturing and distribution facility in the entire world. The decision on where to invest in a new manufacturing plant is one of the most important decisions a company makes. Long term success for the company requires the right location, the availability of a skilled workforce, strong workforce development programs, and well-developed utility, energy, communication, and transportation assets. All of these components are in place in Davie County. Davie County’s location in central North Carolina, bisected by I-40, with I-85 and I-77 only minutes away, is within a one-day drive of 60% of the US market, one half of the nation’s population and one trillion dollars of industrial production. Rail freight services available through Southern and Norfolk Southern and two major airports within about an hour’s drive also make Davie County an attractive location for manufacturing. The commuting pattern for workers in Davie County indicates that over 12,000 people, or 70% of our workforce travels out of the county for work each day while 5,000 people travel into Davie County for work. This 37% workforce net out-migration pattern translates into an available skilled workforce in Davie County. Workforce Development Training and the High Performance Manufacturing Association hosted by DCCC, the Community College of Davidson and Davie Counties, provides cutting edge, globally competitive workforce development solutions through campuses in Davidson and Davie Counties. A key player in helping match companies in search of new opportunities with critical infrastructure and land-related resources is the Davie County Economic Development Commission. Visit the Davie County EDC web site to learn what Davie County has to offer for businesses of all sizes in one of North Carolina’s most progressive and business friendly counties. An award from the state’s Job Development Investment Grant (JDIG) program to Ashley will help facilitate its expansion. Approved earlier Tuesday by the Economic Investment Committee, the reimbursements may total as much as $4.6 million from 2016 through 2027. The program by law must result in a net revenue inflow to the state treasury over the life of the award. In the case of JDIG-supported projects in Tier 2 counties such as Davie County, 15 percent of the award is directed to the state’s Industrial Development Fund – Utility Account to help finance economic infrastructure in less populated Tier 1 and Tier 2 counties. Ashley’s expansion could provide as much as $511,900 in new funds for the Utility Account. 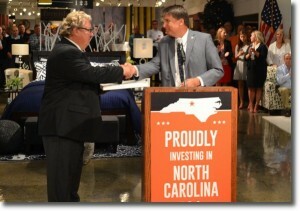 The project was also made possible by a performance-based grant from the One North Carolina fund of up to $829,500. Companies receive no money up front and must meet job creation and investment performance standards to qualify for grant funds. One NC grants also require and are contingent upon financial matches from local governments. In addition to N.C. Commerce and the Economic Development Partnership of N.C., other key partners in the project include the North Carolina Community College System, Davidson County Community College, the Davie County Board of Commissioners, Davie County Economic Development Commission, Duke Energy and the Golden Leaf Foundation.